Prince Henry of the Netherlands was one of the richest Princes in the world. A silver mine in America brings him a princely income and he has many Dutch, Russian and other bonds, with 99 properties in Holland – the maximum number, for the King alone can own 100 – and some in other countries. 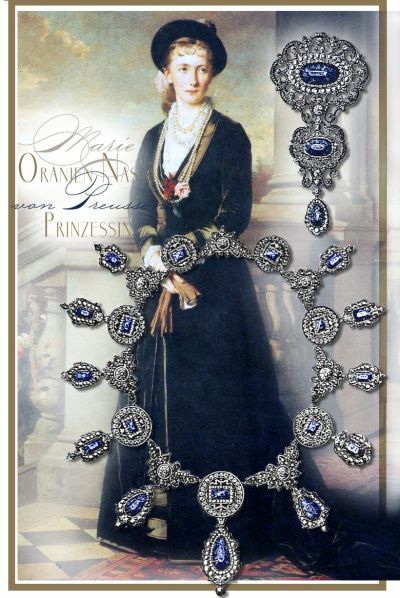 His royal Bride has got the richest jewels …the oranien nassau diamonds…. 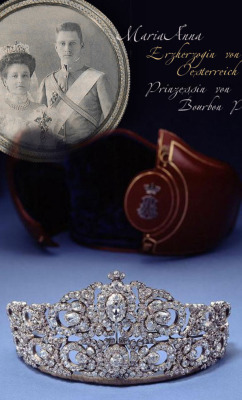 As a gift from the Emperor and the Empress, the Princess Bride Marie, a 9-star brilliant tiara, is enough; the same is made by the court jewelers S. Friedeberg & Sons, after the diadem which Princess Elizabeth received during her marriage. According to the composition of the individual parts, 24 different forms, u. 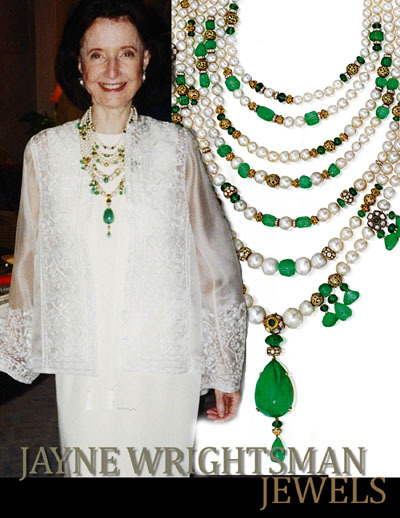 A. also representing a necklace, to be a masterpiece of jewelry. 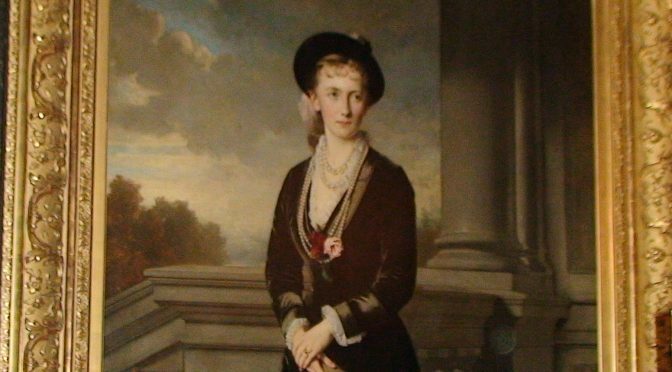 By contrast, the very same jewelry gifts have been carried out by the same company in private compositions, which the prince Heinrich venerated his bride. 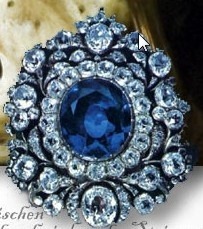 It is a double jewelry: tiara, corsage and necklace in sapphires and diamonds, as in diamonds to wear. 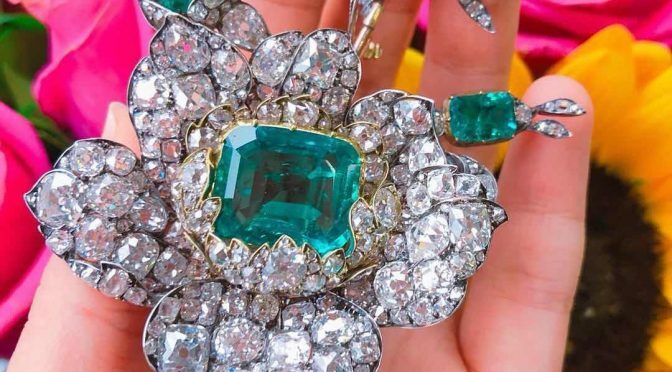 The stones supplied by the prince are among the greatest rarities, and a large sapphire and a large diamond below are estimated at 100,000 each; the whole decoration has a value of more than 1 000 000. 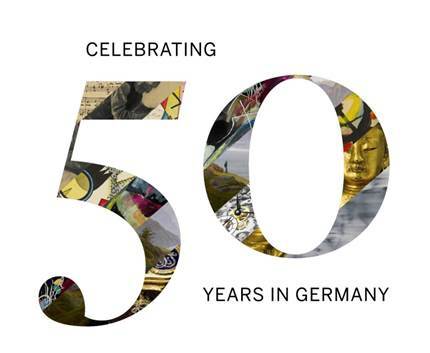 The Berlin industry has been particularly honored to be entrusted with the creation of the jewelery, which was supplied by the court jewelers S. Friedberg Sons. 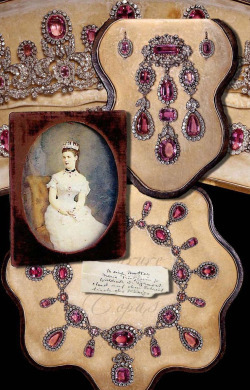 The whole Corbeille de mariage consists of a diadem, a corsage (big brooch), a necklace with 11 pendulum oques and an extension of the same to the corsage as so-called. Esclavage, which ends in two shoulder brooches. This jewelery, made after drawings by Holbein, can be worn in two ways, with sapphires or all in brilliants. 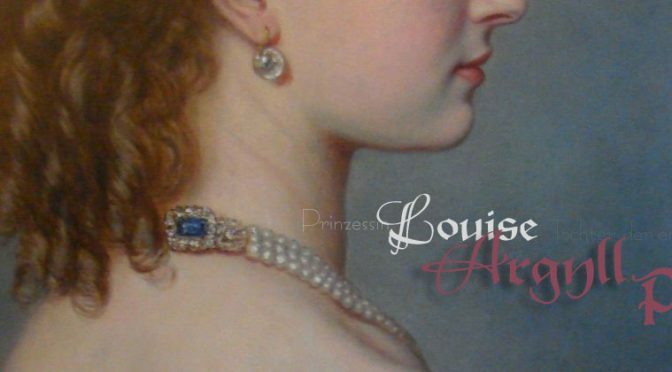 The large sapphires and diamonds supplied by Prince Heinrich are among the rarities that hardly any of the most famous treasure troves in the world have. The great sapphire of the corsage, weighing about 200 ct, of the most beautiful purest blue of more than 100,000 ct in value, is of no less beauty than a second sapphire cabochon of over 100 cts, which is matched by the five large sapphires of the diadem. The large brilliants to be screwed in place of the sapphires, solitaires from 10 to 30 carats a piece, are of the purest water as they are brought to Brazil only in the earliest time to days. 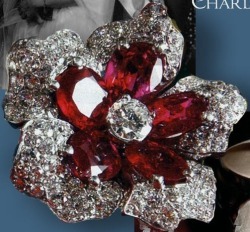 All jewelry is protected from a value of one million marks. News about the historic emerald! 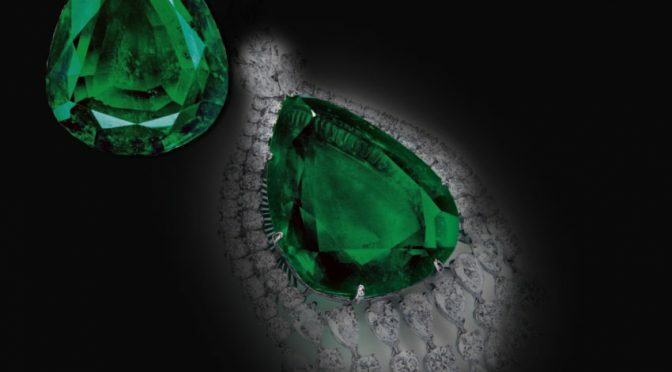 The stone was reputed to be the second most beautiful large emerald in the world, surpassed only in weight, by another emerald owned by Catherine the Great. John D Rockefeller Jr from 1964 and then changing hands several times, Esmerian a.s.o until today in the collection of a distinguished private collector. 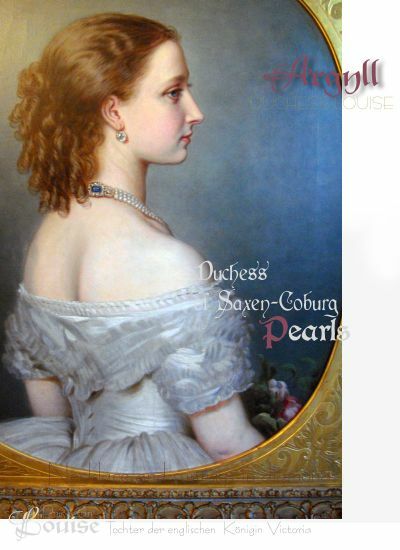 This legendary pear-shaped gem weighing today 75.61 carats was part of the Russian Imperial collection for over 100 years before it was given by Tsar Alexander II of Russia to Grand Duchess Vladimir, born Duchess Marie of Mecklenburg-Schwerin 1854-1920 (Grand Duchess Maria Pavlovna), on the occasion of her wedding to his son Grand Duke Vladimir Alexandrovich of Russia in 1874. 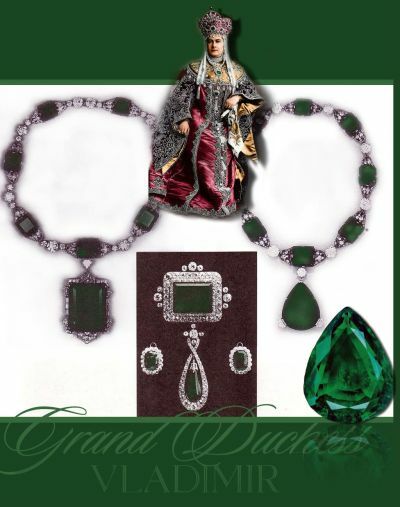 Grand Duke Boris, her son, who got all her emerald jewels, sold this emerald, upon his mother`s death, to Cartier in 1927. Will be auctioned at Geneva in May 2019 by Christie’s Estimate $2.3-3.5m. Fürstin Margarita zu Hohenlohe Langenburg, geb Prinzessin von Griechenland und Dänemark trug diese Garnitur noch in den 60er Jahren zu glanzvollen Events. SpannendeGeschichte und Geschichten zu historischen Juwelen und Schmuck! 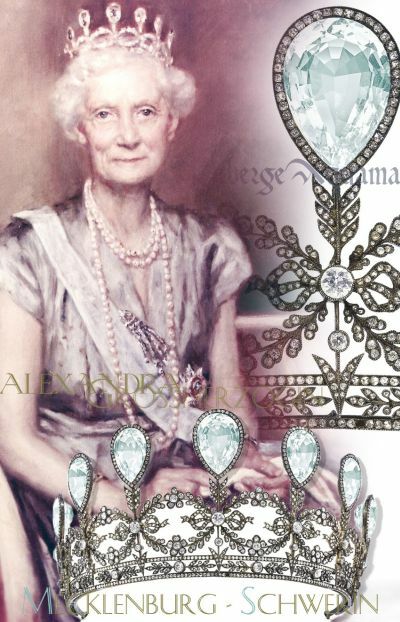 Over more of four centuries this amazing tiara was hidden in the vault of the royal family…. Anekdoten und Geschichten vermitteln einen kleinen Einblick in die tagtägliche Arbeit. In ihren Blogbeiträgen feiern die ExpertInnen von Sotheby‘s das 50-jährige Jubiläum auf persönliche Art und Weise und blicken dabei auf legendäre Ereignisse und unvergessliche Momente zurück. Manchmal können Märchen tatsächlich wahr werden. Anlässlich des 50ten Jubiläums, kommen die schönsten Geschichten zutage; so beispielsweise vor vier Jahren, als die Expertin im Rahmen eines Schätztages in Deutschland während eines Haubesuches auf eine seltene und große, feuervergoldete Bronzefigur des Buddhas Vairocana stieß, datiert aus dem 15. Jahrhundert. Wie sich zeigte, ist lediglich ein weiteres Exemplar dieses Modells aus dem 15. Jahrhundert bekannt, das sich in der Sammlung des Newark Museums in NewJersey befindet. Die aus einer deutschen Privatsammlung in die Pariser Auktion eingelieferte imposante Bronzefigur, geschätzt auf € 300.000-500.000, wechselte 2015 für sagenhafte € 3.4 Millionen ($ 3.85 Millionen) in den Besitz eines asiatischen Sammlers. Eine schöne Arbeit von Wassily Kandinsky mit dem bezeichnenden Titel Leise. Taxiert auf£ 100.000-150.000erzielte die geometrische Komposition des Künstlers 2017 in London mit £ 308.750 mehr als das Dreifache des unteren Schätzpreise. 2003 besuchte der Experte das Anwesen eines Adelsgeschlechts in Deutschland. In der Bibliothek bemerkte er eine schöne Tischuhr von einem der bekanntesten Uhrenhersteller der Welt – Thomas Tompion(1639-1713). Obwohl sich die Uhr bereits seit Generationen an ein und demselben Ort befand, kannten die Besitzer nicht den Wert und rechneten daher nicht mit der damaligen Bewertung. 2003 erzielte dieses seltene Exemplar in der Auktion in London ein Ergebnis von £ 901,600 und avancierte zur damals teuersten jemals in Europa verkauften Uhr. 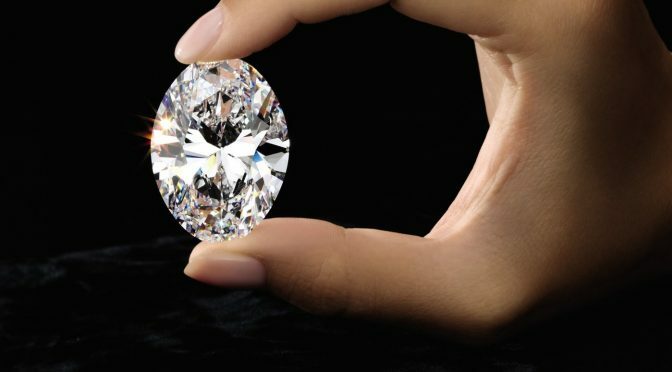 Three clients from the region competed for the stone – testament to the strong demand for diamonds of this quality in this part of the world. Finding a rough diamond that allows the cutter to fashion a stone of over 80 carats is a true and very rare discovery. 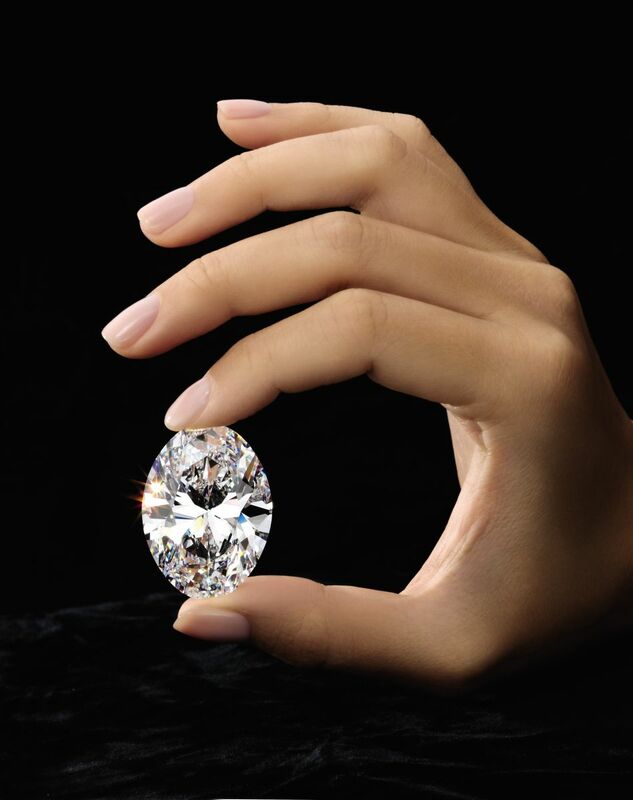 The 242-carat rough stone which yielded the diamond was discovered in Botswana in the mine of Jwaneng, a mine owned in partnership by De Beers and the government of Botswana and known for producing roughs of the highest quality. Following its discovery, the rough was cut and polished over a period of intense months to produce a symmetrical and striking oval brilliant diamond. Given the elongated shape of the rough the oval shape was chosen to preserve the greatest amount of weight. Great skill and precision was needed to cut a stone of this importance – a level of expertise and craftsmanship possessed by only a small handful of cutters in the world. A symbol of perfection and eternity, often associated with prosperity, the number eight is considered a lucky number in China and other Asian cultures. The Chinese pronunciation of 8 (bā), similar to that of 發 (fā) meaning wealth or fortune, is welcomed as a blessing of affluence. In its duality – 88 – it is believed to bring good wishes in abundance. There is also a visual resemblance between 88 and 囍 (literally: „double joy“), a popular decorative design composed of two stylized characters 喜 („joy“). striking motif features round diamonds, pear shaped diamonds and navette diamond are set at varying angles to create sculptural, highly-dimensional designs that capture the light from all directions. 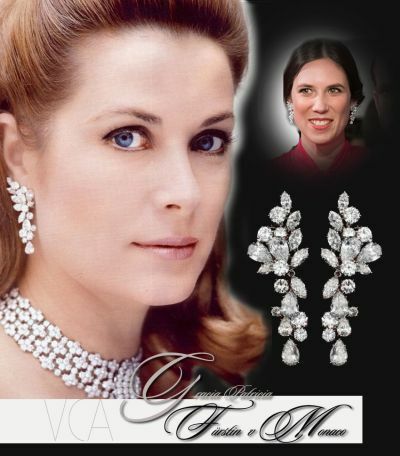 Princess Caroline of Hanover, at the Bal de la Rose 2019 in Monaco, wore her mother pearls, a wedding gift from her father Prince Rainer. Die Parure wird komplettiert durch ein ebenfalls dreireihiges Armband mit Diamantrosen als Zwischteile, einem Perlen Diamant Ring und einem Paar Diamant Perlen Ohrclips. 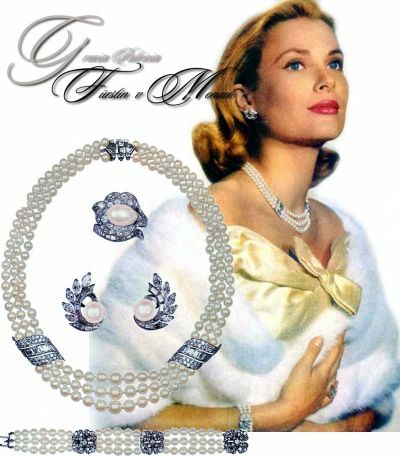 Louis Arpels den Prinzen persönlich beraten, er empfahl die Perlen, denn die Perlen harmonisieren wunderbar mit der delikaten Schönheit von Grace Kelly.